The article deals with the problem of theoretical and legal separation of the patient's responsibilities. On the basis of the analysis of the legislation of Ukraine and foreign countries, the list of responsibilities of the patient is set out in the list of positive realization practice.The following groups of patient’s responsibilities are classified by the level of legal consolidation. 1. Buletsa S. B. Prava ta oboviazky patsiienta ta likaria. [Rights and responsibilities of the patient and the doctor] Naukovyi visnyk Uzhhorodskoho natsionalnoho universytetu. Seriia: Pravo. 2016. Vyp. 41(1). рр. 93–95. 2. Pishhita A. N. Pravovoj status rossijskogo pacienta. Zhurnal rossijskogo prava. 2005. No. 11. pp. 46–53. 3. Your Rightsand Responsibilitiesas a Patient Patient Stanford Health Care (SHC). Stanford Medical Center. Available at: https://stanfordhealthcare.org (accessed: 11.02.2018). 4. 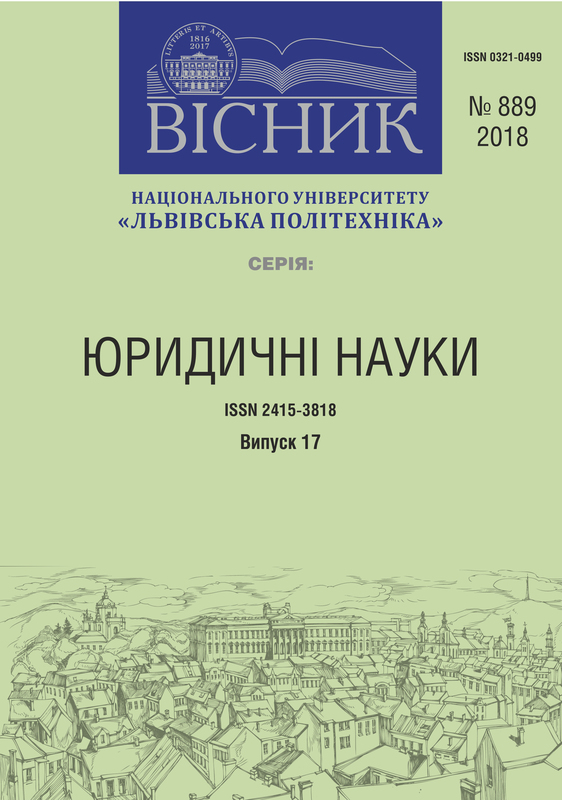 Ob osnovah ohrany zdorov'ja grazhdan v Rossijskoj Federacii: Federal'nyj zakon Rossijskoj Federacii [On the fundamentals of health protection of citizens in the Russian Federation: the Federal Law of the Russian Federation] ot 21.11.2011 No. 323-FZ. Availableat: http://www.consultant.ru/document/cons_doc_ LAW_121895/ (accessed: 27.02.2018). 5. Osnovy zakonodavstva Ukrainy pro okhoronu zdorovia: Zakon Ukrainy [Fundamentals of Ukrainian Health Law: The Law of Ukraine] vid 19.11.1992 No. 2801-XII. VidomostiVerkhovnoiRadyUkrainy.1993, No. 4, st. 19. 6. O zdravookhranenyy: Zakon Respublyky Belorus [On Health: The Lawofthe Republic of Belarus] ot 18 yiunia 1993 h. No. 2435-XII. 67 Availableat: http://ncgb.by/index.php/2015-01-30-08-14-33/33-pravovaya-informaciya/41... (accessed: 27.02.2018). 7. Pro zatverdzhennia Poriadku provedennia medychnykh ohliadiv pratsivnyki vpevnykh katehorii [On Approval of the Procedure for conducting medical examinations of employees of certain categories]: NakazMOZ Ukrainy vid 21.05.2007 roku No. 246. Ofitsiinyi visnyk Ukrainy vid 06.08.2007. 2007r., No. 55, s. 138. 8. Ob okhrane zdorovia hrazhdan: Zakon Turkmenystana [On protection of citizens' health: the Law of Turkmenistan]ot 23 maia 2015 hoda No. 223-V. Availableat: http://online.zakon.kz/Document/ ?doc_id=39773726#pos=0;0 (accessed: 27.02.2018). 9. 1 z 10 novonarodzhenykh u vsomu sviti ne otrymaly shcheplennia Spilnyi pres-reliz YuNISEF/VOOZ [One in 10 newborns around the world did not receive vaccine UNICEF / WHO Joint Press Release]. Availableat: http://www.who.int/mediacentre/news/releases/2017/infantsworldwide- vaccinations/en/ (accessed: 15.02.2018). 10. Okhoplennia imunizatsii: Informatsiinyi lyst VOOZ [Immunization coverage: WHO newsletter]: perehlianutosichnem 2018 r. Availableat: http://www.who.int/ mediacentre/factsheets/fs378/en/ (accessed: 22.02.2018). 11. Ob obshhestvennom zdorov'e: Zakon Gruzii [On Public Health: The Law of Georgia]27 ijunja 2007 goda No. 5069-vs (InRussian)Availableat: http://extwprlegs1.fao.org/docs/pdf/geo137723.pdf (accessed: 27.02.2018). 12. The Patient Rights (Scotland) Act 2011: on 24 February 2011 Availableat: http://www.nationalarchives.gov.uk/doc/open-government-licence (accessed: 22.02.2018). 13. Ontherightandresponsibilitisofthecitizensinthehealthcare: The Assembly of Kosova, Law No.2004/38 Availableat: https://www.kuvendikosoves.org/common/docs/ligjet/2004_38_en.pdf (accessed: 22.02.2018). 14. Wellness Centeruniversiry of Nebraska: Health Services Responsibilitiesof Patients. Availableat: http://www.fhwclnk.com/index.htm?gclid=EAIaIQobChMI9v7zy53i2QIVgkkYCh2ZL... vD_BwE 15. Pationsbillofrightandresponsibilitiesthe University of North Dakota Student Health ServicesAvailableat: https://und.edu/health-wellness/student-health/ (accessed: 24.02.2018). 16. PATIENTS CHARTER: Parliamentary Secretary for Healthin Malta. Availableat: https://ehealth.gov.mt/ HealthPortal/ public_health/environmental-health/department_for_env_health.aspx (accessed: 14.02.2018). 17. Adherenceto Long-TermTherapies: EvidenceforAction. New-York, WHO, 2003 Availableat: http://whqlibdoc.who.int/ publications/2003/ 9241545992.pdf. (accessed: 14.02.2018). 18. Schmidt F. Non- ComplianceverursachtvermeidbareKostenbeiKrankenkassenAvailableat: http://www.abda.de/52+B6Jm NIYXNoPTM0NzVlNTQ1MmEmdHhfdHRuZXdzW2JhY2tQaWRdPTI0JnR4X3R0bmV3c1twb2ludGVyXT0 yJnR4X3R0bmV3c1t0dF9uZXdzXT0xNTEx.html. (accessed: 14.02.2018). 19. GrafM. Dievolkswirtschaftlichen Kostender Non-Compliance: Eineentscheidungsorientierte Analyse. Bayreuth P.C.O. Verlag 2007. 20. El Malla H., Ylitalo Helm N., Wildering U., ElSayed Elborai Y., Steineck G., Kreicbergs U. Adherencetomedication: A nation-widestudyfromtheChildrensCancerHospital (Egypt). World J. Psychiatry, 2013;3(2):25-33. 21. Barry C. A., Bradley C. P., Britten N., Stevenson F. A., Barber N. Patientsunvoicedagendasingeneralpracticeconsultations: qualitativestudy. BMJ. 2000.Vol.320. P.1246–1250. 22. Bill of Rightsofthe South African Constitution (Act 108 of 1996). SA Medical Association (SAMA) URL https://www.samedical.org/images/attachments/rights-and-responsibilities... (accessed: 22.02.2018). 23. Florida State University: University Health Services URL H:\AAAHC\P&P\Administration\PP PatientRightsand Responsibilities.docx (accessed: 22.02.2018). 24. Patient Rightsand Responsibilities: Cone Health – The Network for Exceptional Care – Cone HealthAvailableat: https://www.conehealth.com. 25. Brovarska tsentralnaraionnalikarnia. Prava i oboviazkypatsiientiv [Brovarsky Central District Hospital. Rights and responsibilities of patients] (In Ukrainian) Availableat: http://brovcrl.in.ua/prava-i-obovyazky-paciyentiv. accessed: 23.02.2018). 26. Zrazok oformlennia prav ta oboviazkiv patsiientiv: Dodatok 1 donakazuholovnoholikariaZrazkivskoimiskoidytiachoiklinichnoilikarni [Sample registration of patients' rights and responsibilities: Appendix 1 to the order of the chief physician of the Zazzhkiv City Children's Clinical Hospital No. 3] No. 3 vid 16 lystopada 2015 roku (In Ukrainian) Availableat: https://www.medsprava.com.ua/article/401-qqq-16-m9-12-09-2016-prava-ta-o... u-medichnomu-zaklad (accessed: 23.02.2018). 27. Prava ta oboviazky patsiientiv: Klinika “Medibor”, Dodatok 2 donakazu z osnovnoidiialnosti[Rights and Obligations of Patients: Medibor Clinic, Annex 2 to the order of the main activity] 01.04.2010 No. 4-od (In Ukrainian).Availableat: https://medibor.com/ua/rights/index (accessed: 23.02.2018). 28. Pravyla perebuvannia patsiientiv u KLPZ “Chernihivskyi oblasnyi kardiolohichnyi dyspanser”[Rules for staying patients at the Chernigiv Regional Cardiology Dispensary] (InUkrainian) / Availableat: www.okd.org.ua/wp-content (accessed: 23.02.2018). Shchirba M. "Types of the patient’s responsibilities". http://science.lpnu.ua/law/all-volumes-and-issues/volume-5-number-889-17-2018/types-patients-responsibilities.